If you know your physics, you know the faster a flywheel spins, the more energy it stores. As that energy is released as torque, its speed reduces. Applying that principle, one engineering student slapped one on a bicycle as an energy booster. 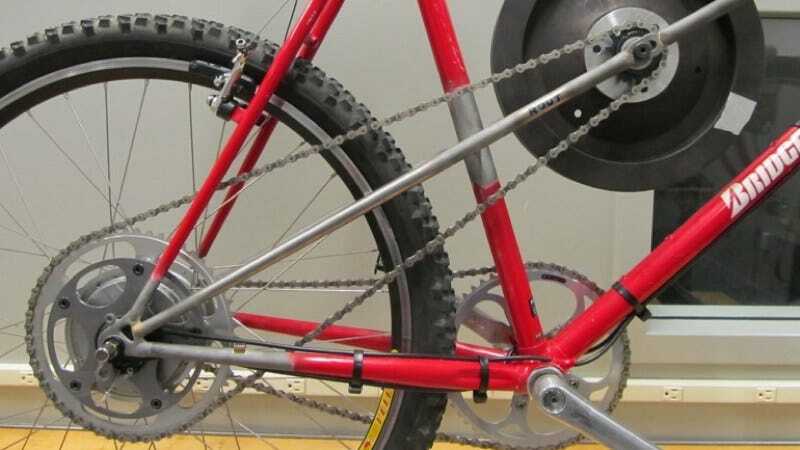 Maxwell von Stein, a student at New York's Cooper Union, mounted to the bicycle's frame a 15-pound flywheel, connected to a NuVinci continuously variable transmission at the rear wheel. A selectable "charge" ratio increases the flywheel's speed during braking or hill descent, and a separate "boost" ratio converts the flywheel's speed into torque for accelerating or climbing a hill. The result, von Stein says, is a 10 percent net savings in pedal energy during a ride averaging 12 mph and 15 mph.